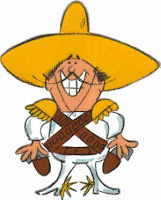 I remember as a kid hearing Mel Blanc voicing the animated Frito Bandito, a character who loved Frito Lay products so much that he would steal them. The problem... the stereotypical character was offensive to Mexicans and persons of Mexican descent. Well, actually only 8% of those polled found the character offensive. Thus, the end of a television icon.